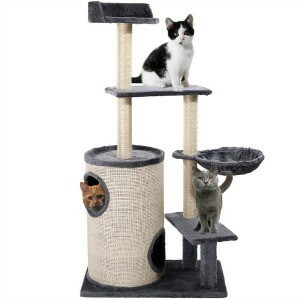 4 What To Look For in the Best Cat Trees for Kittens? Kittens are frail but still need much of the same exposures as adult cats like climbing, scratching and jumping. Kittens won’t stay small for long and it can seem like buying furniture for a short period of time is a waste of money. The latter being a poor excuse because the best cat trees for kittens will also be useful to them as adults. Stay away from the flimsy, cute crap that is meant to be a literal money sink and purchase sturdy, functional structures that your kitten is more likely to use. In addition, you should be adding MORE pieces as your cat grows and to start collecting cat furniture from when they are kittens makes the financial requirements less burdensome. This is one of our top recommendations because of the unique style of the condo. It has plenty of space for your kitten to hide, play and still interact with the outside undercover. The platforms are situated close together for easy climbing and under 5 ft tall, this cat tree is low enough where you do not have to worry about it suffering from an unexpected fall. The extra scratching surfaces are also a plus because not only will your kitten be able to scratch them but it will also be able to climb or shimmy up them. If you have multiple kittens, this is a great option because there is plenty of room for them to play and it can suitably hold multiple kittens. This cat tree is perfect for single or multiple kitten homes. It is a couple inches over 5 ft but that’s not enough to cause concern. Your kitten will get plenty of stimulation while dashing up and down the ramp and back and forth through the tunnel. There is plenty of relaxing areas in and out of site so your kitten won’t feel exposed. The poles are covered in sisal rope which is excellent for scratching and shimmying up. They will be so busy using this tree that they’ll forget about the couch arm. 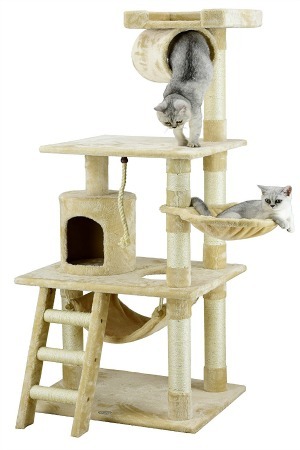 Your kitten will enjoy the softness and comfort of this cat tree. It is rare that any product receives 5 out of 5 stars overall but this one does out of 185 reviewers! 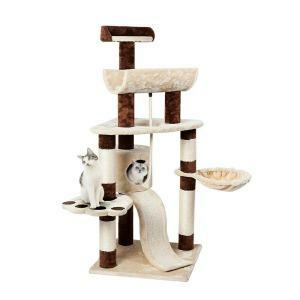 This is a good cat tree for your kitten because it features a ramp that leads to not only one but two large condos. It also has protective barriers on the platform beds which will protect your kittens from falling while rolling around whether in play or in sleep. It is also sturdy and safe for your kitten being made out of CARB certified board which means in plain terms that the board doesn’t contain any harmful chemicals like some other manufactured versions. Although this is partially plastic, this tree is a really nice concept. It is literally a tree. Its a shame the leaves are plastic but I’m not sure there are any other options other than real leaves that won’t survive your cat’s battery. 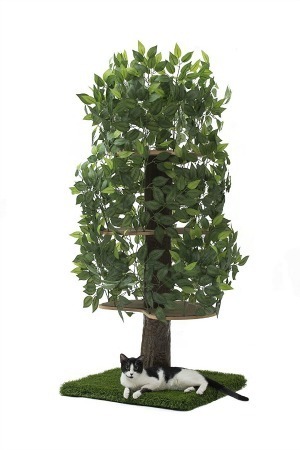 The platforms are hidden within the tree and your kitten will have a taste of nature as it safely climbs from one level to the other. It is suitable to hold 32 lbs so it can hold multiple kittens at once. If you like the cuter things in life this is a good one for you that is also a great option for your kitten. I mean, one of the platforms are shaped and decorated to look like a kitten paw. How cute is that?! In addition, it makes use of the ramp as a scratching post which means that you can be pretty sure its climbable. The downside about this cat tree is that there isn’t much hiding places for your kitten as some of the others we’ve shown you prior so it might feel a little exposed. But your kitten will be playing a lot more than the average cat so that’s not quite a deal breaker in this instance. It’s easy to assume that your tiny ball of fur doesn’t need much besides a ball of yarn. While a ball of yarn is a great interactive tool for you and your kitten to play with together, it will not fulfill all of your kitten’s needs. Remember that most development in any animal happens when it is young. For this reason, it is especially important for you to expose your cat to climb, scratch and jump. This allows it to practice the hunting motions that its body is driven to perform even if it never actually hunts a day in its life. Getting your kitten a cat tree will help its musculoskeletal system to develop properly by exposing it to getting a good workout on a properly equipped cat tree. Many people think that it is ok for their cats to get their workout on household items. This common practice is impractical and dangerous. First of all, your cat’s claws are not suited for materials other than wood like concrete and other slippery surfaces. In addition, your cat can cause an accident by unintentionally turning on a switch like the one to your stove top. This creates a potentially harmful situation as it can lead to a house fire. Take my word for it because this has happened to me. An ounce of prevention is worth a pound of cure. Get your kitten and cats the right climbing structures for the betterment of your entire household. What To Look For in the Best Cat Trees for Kittens? As I eluded to in the intro, there are tons of options when it comes to kitten climbing structures most of which are complete garbage. This is because they are flimsy but also because they don’t meet any or most of your kitten’s needs. I don’t know about you but in my mind, the best way to spend money is to get the MOST out of my money instead of buying cheap which leads to even more money spending over time. So before we get into our recommendations, I want to let you know why we have chosen these and what you need to look for if you decide to go rogue and keep searching on your own. Just like an adult cat, kittens have their own set of needs, habits, and preferences that must be met in order for them to develop into healthy adults. For instance, kittens love to play and in particular climb. They have razor sharp claws that do not retract until they are a couple of months old. Kittens enjoy shimmying up poles but would prefer to stay closer to the ground as they have not yet developed enough skills to handle heights. I personally like the Go Pet Club; it looks practical and fun for kittens. I will show this article to my girlfriend, I am sure she will love it! Hey Marlinda, thanks for this article. I recently got a new kitten and wanted to see if he would be okay with my eldest cat tree structure or if I should invest in a new one more fitting for him. I think I will just get him one of these, so he can have the best experience. My older cat is just lazy now days and won’t enjoy it his current. Thank you for this great information. Hey Victor! I’m so happy you enjoyed and found value in this information. Hope your kitten enjoys his new tree! Also, your older cat might be experiencing some joint issues as cats usually do as they age. If you haven’t already, you may want to take him to get checked out by his vet to be sure 🙂 Here’s more info if you need it, click here. This is a great site, I have looked over a couple things and I actually will be putting a order in soon, my cat deserves one of these beautiful trees. I like how everything is organized and every product is very well described and detailed. This number 3. 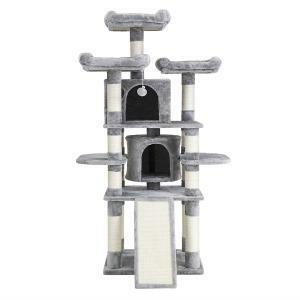 SONGMICS Cat Tree Condo with Scratching Post Pad is amazing. Hey Tommy! That’s awesome! Thanks so much and I’m glad you’re hooking ur Kitty up with a nice cat tree! Hope s/he enjoys it!